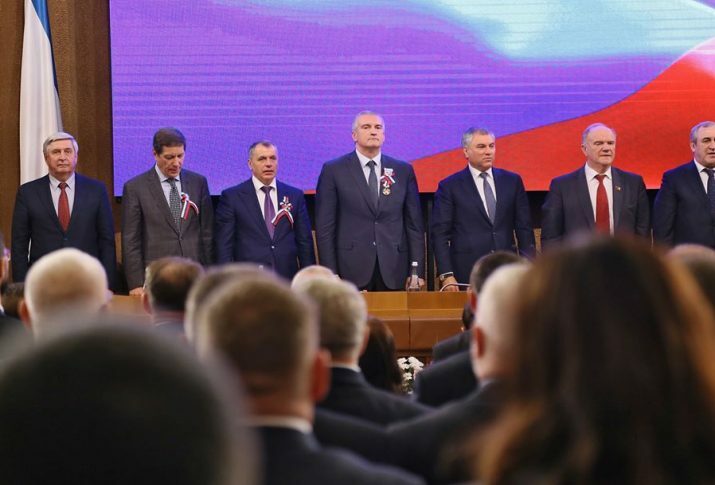 March 15, 2019, in Simferopol, a joint meeting of the Council of the Russian State Duma with the Crimean “parliament” took place. The meeting was dedicated to the fifth anniversary of the seizure of the Ukrainian Crimea by Russia. Leaders of all Russian parliamentary factions – Sergei Neverov (United Russia), Gennady Zyuganov (CPRF), Vladimir Zhirinovsky (LDPR) and Sergei Mironov (“Fair Russia”) arrived to the occupied peninsula especially for “solemn” events. The delegation of more 40 Russian MPs was headed by the State Duma Speaker Vyacheslav Volodin. During his speech, Volodin made a number of resonant and rather contradictory statements that were cited by the Russian Interfax. QHA media decided to quote some statements of the State Duma Speaker in full. Ukraine treated the Crimea very, very dishonorable: Violation of the fundamental rights of citizens, the right to language, the right to education in their native language, the economy of Crimea and Sevastopol are ruined. In fact, it was annexation. Analyze, calculate how much the economy of Crimea lost due to the destructive policy of Ukraine that was spread here, how much the people have lost, what rights were violated, and through our parliamentary structures and European structures, we will obligate Ukraine to compensate for what the Crimea lost over those 25 years. As for money, it is necessary to calculate what the debt of Ukraine is, and since they are still supported by the European Union, their debts will go to the European Union too. And in this matter we do not need to be modest and show everyone understanding.